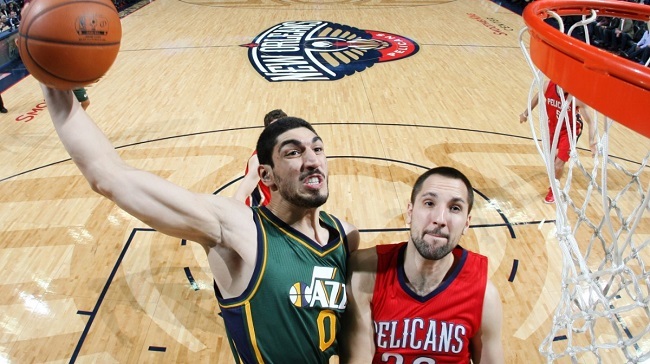 Early into his fourth season with the Utah Jazz, 22-year-old center Enes Kanter is still something of a project. But NBA teams are almost always willing to take their time and tinker with a 6-foot-11, 260-pounder with strong hands and quick feet. Born in Switzerland, raised Muslim in Turkey and recruited by some of the top college basketball programs in the United States, Kanter attended the University of Kentucky, but he was ruled ineligible to play by the NCAA for essentially playing as a pro in Turkey. Left with little choice but to declare for the NBA Draft, Kanter was taken with the No. 3 overall pick, ahead of eventual stars such as Kemba Walker, Klay Thompson and 2014 NBA Finals MVP Kawhi Leonard. Kanter put that offensive repertoire on display Dec. 16, when he scored a career-high 29 points against the New Orleans Pelicans on 12-of-22 shooting from the field and 5-of-6 from the free-throw line. Although Utah lost the game, Kanter’s performance — while matched up primarily with league MVP candidate Anthony Davis and rugged defender Omer Asik (another Turkish Muslim) — was one of this season’s bright spots for the rebuilding Jazz franchise. Through Saturday’s schedule, Kanter is averaging 14.1 points (a career-best) and 7.1 rebounds. His Player Efficiency Rating of 18.20 is higher than former league MVP Derrick Rose, former Finals MVP Tony Parker, and reigning league Defensive Player of the Year Joakim Noah, to name a few.